· Tree of Life Organic Microwave Popcorn- I recently wrote a blog post and recipe about how to make healthy popcorn. The recipe was great and you can read all about it here. But, the reason I came up with this recipe was that a healthy, microwave version just did not exist. I am not really a fan of microwaves for a number of reasons (which is why my recipe is a stove top recipe) but Tree of Life popcorn seems different. Made with 100% organic corn (which makes the chances of the corn being GMO, a whole lot less and in the case of Tree of Life, it’s certified non-GMO) has zero trans fats, is flavored with organic sea salt, and their “original” version is relatively speaking, low in fat. 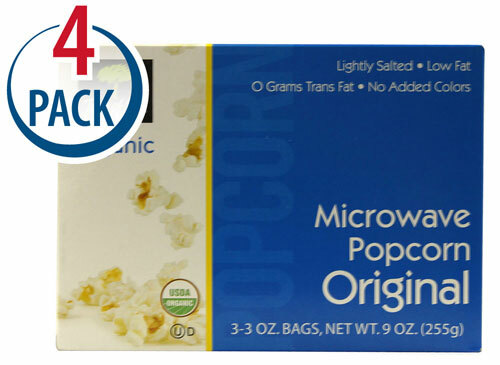 It is a great alternative to the current crop of microwave popcorn. Look for their popcorn on Amazon.com. · FES Flourish Formulas-I’m slowly becoming acquainted with homeopathy so I was thrilled to find this little kit called Seasons of the Soul Oils. 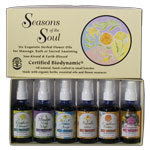 Seasons of the Soul are 6 solar infused herbal flower oils for massage and bath. They are Demeter-certified biodynamic. This certification is the oldest traditional organic certification in Europe and is regarded as the highest grade of organic farming in the world. Certification is difficult to come by and must be renewed annually. The certification verifies the fulfillment of the standards on behalf of the farmers, which in turn guarantees high quality food products to the consumers. The kit includes Arnica Allay- restorative for trauma and injury, Benediction Oil- to bless, sanctify, and transform, Calendula Caress-soothes inflammation and softens skin, Dandelion Dynamo-releases muscle tension and energizes the body, Mugwort Moon Magic-warming and nourishing for the circulation, and St. John’s Shield- Light regeneration for depression and depletion. I think these seem very interesting. It’s an area of mind/body medicine of which I’m not too familiar. I can’t wait to try this out to see what benefits I’ll reap from them. Essential oils were a big part my friend JJ’s son’s healing process when he was tragically struck by a hit and run driver last fall. www.fesflowers.com . I believe that some of them really do possess healing properties. 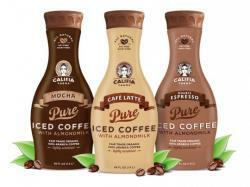 · Califia Farms- Califia Farms almond milk iced coffee is amazing. I tasted these iced coffee "treats" and just flipped for them. A marriage of 2 of my favorite flavors: almond and coffee equals nothing short of amazing. Califia Farms already has a stellar reputation when it comes to manufacturing almond milk. A great alternative to traditional coffee and ice coffee, they are made with almond milk and cane sugar (much less sugar than your average Frappucino or Ice Blended Mocha.) The Double Espresso flavor is the lowest in sugar with 10g per 8 oz serving and then the Café Latte with 12g. The Mocha flavor has 15g of sugar. So yes, they have some sugar but in small quantities, as a treat (I tried them is shot glasses), these non-dairy, soy-free iced coffees are just fun and delicious! They are due on the market this summer so keep a look out! Perfect for when you want something quick and small that won’t do a lot of damage (if you know what I mean.) www.califiafarms.com.